Of all the dangers in the world, and all the possible ways to be violated, the risks coming from anarchists are so minuscule as to be nonexistent. As far as I can tell, I have never been violated by an anarchist. No, all the dangers I face out there come from archators, looking to take my stuff and violate my person. And the vast majority of them archate through The State. They are statists- the largest segment of the archator population. When I look around and realize that almost everyone I encounter supports bullying and theft, it can be a little scary. Sure, most of them "only" support evil within certain parameters- as long as the bad guys call themselves government and only violate me as much as their "job" allows- or as much as they can get away with. No one has a right to be a statist who puts their belief into action. That's because human rights and statism are incompatible. 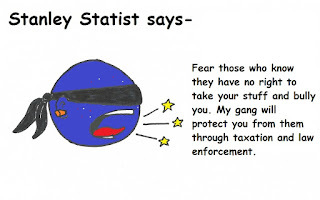 Archators- particularly the variety known as statists- are the real risk, but they want you to worry about those who are no risk to you, so they can promise to protect you from them.